Note: Rain is expected this Friday, which is the planned start date for trolley service. Please check VTA Facebook, Instagram or Twitter social media channels for service updates. This holiday season, riding VTA’s Holly Trolley is a must on your holiday to-do-list. Bring the whole family and enjoy a festive ride to your favorite downtown San Jose destinations. VTA’s five historic trolleys date back to the early 1900’s and were carefully restored through a volunteer process led by public transit champion and former County Supervisor Rod Diridon. The restoration effort was made possible through donations from the community. Each car took over one year of full-time volunteer work to be completely restored. Old parts were saved when possible, and new parts were designed and built when necessary. Special attention was paid to the historic characteristics of cars which have undergone many changes during their lifetimes. Now fully restored, the cars are better than new, with hand-polished wood interiors and fresh coats of brightly colored paint. The trolley will roll through downtown San Jose between the Civic Center and the San Jose Diridon Light Rail Stations on Friday, Saturday, and Sundays from November 23 through December 30, 2018*. 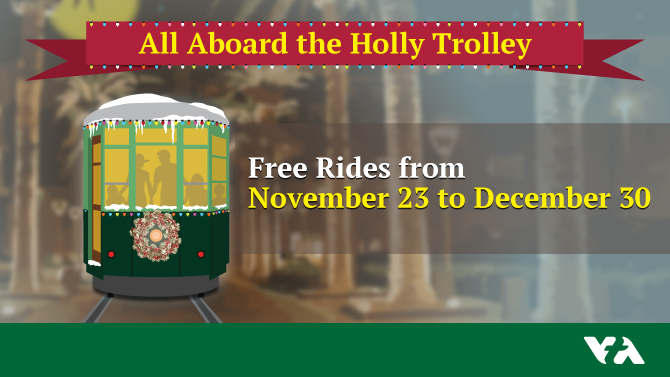 All trips on the trolley are FREE, so hop on board for a jolly good time! For schedule information and more details, visit www.vta.org/trolley. *Weather permitting. The Holly Trolley will not be in service on November 30, December 9, 16 or 23.